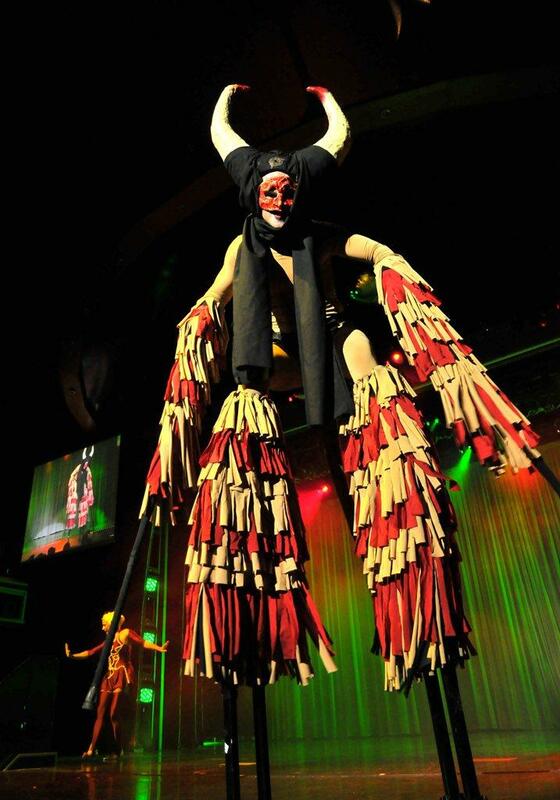 Myth are a very experienced company creating customised circus shows for corporate events as well as performing specialty acts in productions all over Europe, South Africa and more recently on cruise ships. They have conceived, choreographed, designed and performed in 3 different shows designed for cruise ships for the past 6 years and are now returning to their roots, focusing on corporate shows whilst still doing fly on shows for cruise ships. Myth do not just offer a show for your Christmas party or product launch, they offer a show that incorporates your company’s branding into the performance. They will use your logo in their props or costumes, they will design rigging and costumes embracing your corporate logo and even create an act around the event and corporate theme. In the past Myth have designed an aerial act on 4 rings for Audi or an artist ascending out of the sunroof of the new Toyota Rav. Myth can hang aerial acts from a small helium blimp with your corporate logo emblazoned on it and can offer a totally unique climbing wall act with your company colors as a back drop. How about 2 aerial artists hanging from a huge chandelier made up of glasses and champagne bottles handing out glasses to guests as they arrive. WOW is what we will offer! In addition, Myth always employs other performers including opera singers, musicians, actors or poets to compliment their shows. A performance on 2 draped ropes and a ring creating an entanglement of body and rope to beautiful and dramatic music. An aerial act with a difference. A double performance with stunning acrobatics and magical interaction between performers, a real show stopper! When one isn’t enough why not have two?! Two performers use one trapeze to create an astonishing act of daring stunts and incredible acrobatics, not to be missed! An aerial act that is very versitile, easy to rig, needs less height, popular with corporate shows. Myth has performed lyra for Mercedes and Audi, where the prop has been used to form the logo. A passionate and dramatic act on 2 rings. Aerial contemporary ballet is a perfect description. Also called a Tissue Act, the Scarf Act is performed as a cheeky pixie-like character. Fun and light-hearted with breath-taking falls and surprises. A timeless aerial act that flows from one position to another. A mixture of daring tricks and beautifull lines. Requires: A truss at least 3 metres long and with a minimum height of 6 metres Big Band Act A big band act with a difference, you won’t find a band like this one anywhere else! A hillarious set of events as a chaotic and clumsy character who ties himself, and everything around him, in knots. When you thought he had just got it right …it starts again! A pas de duex with a difference…and the added difficulty of stilts! A devil and an angel, beauty and the beast, however you see it but … who is going to dominate? A disastrous attempt to play with a doll by an eccentric and surreal character. A mix of comedy, acrobatics and total sillyness! 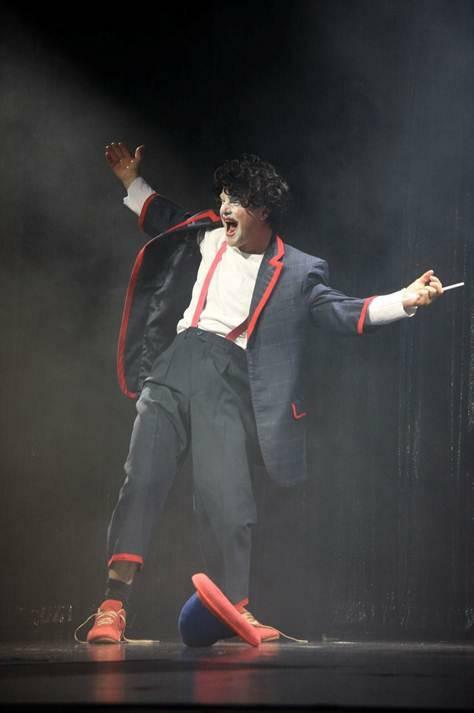 The perfect MC or Ringmaster character on stilts. And with some mind blowing tricks of his own. At last, a truly original show. This is definitely the best show I have ever seen on a cruise ship! We want to thank you so much for booking such a great event for us. They were all wonderful, very helpful, great performers and acts and they put a special effort to entertain all the guests, especially the children. Our client and most importantly the visitors liked them so much!